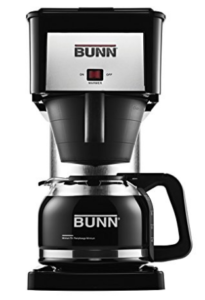 These days you don’t have to fork over a ton of beans to score a great coffee maker. For less than $100, you can find coffee makers that are highly customizable that brew to your temperature and flavor specifications. Many will brew as little as one cup or as many as 14. If you want to spend less, but are willing to sacrifice some of these features, take a look at our top coffee makers under $50. Coffee makers are as unique as their users, so we’ve compiled our top picks based on everything from space requirements to the fastest brew times and easiest models to clean. Less than $30 nets you a pretty incredible machine. 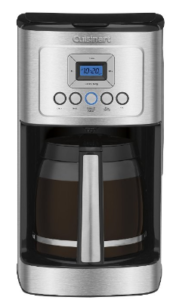 It features a 12 cup glass carafe, auto programming and auto two hour shutoff, along with the sneak-a-cup feature that stops brewing temporarily so you can get a head start on your morning joe. Pros: Highly rated on Amazon, many users agree that it’s well-engineered and delivers a great cup of coffee for a budget price. Cons: It lacks a few extra features like a water filter and the bold setting found in other, more expensive models. Check for current prices and sales on Amazon. For a versatile coffee maker that just tips the $50 mark, it’s tough to beat the Hamilton Beach Single Serve. This coffee maker offers the flexibility to fill a 14 oz. travel mug or brew a 12 cup pot of coffee. Separate water reservoirs make it possible to quickly do both and you can choose between adding your favorite ground coffee to its mesh filter or popping in a pre-packaged soft pod. Customize it further by selecting the bold brew for a stronger extraction. Pros: Programmable with a 2-hour shut off time. Compact and perfect for even the smallest spaces and a convenient way to integrate two machines in one. The perfect way to brew a single cup without the added expense of K-Cups. Cons: A permanent mesh filter isn’t included in the carafe side, but can be purchased separately. Check for current price and sales on Amazon. Every coffee connoisseur knows that freshly ground coffee produces the best flavor, but many people don’t have the space or budget for a grinder and a coffee maker. 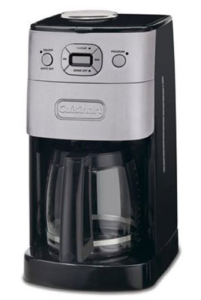 The Cuisinart Grind-and-Brew offers the best of both worlds and even measures out the perfect amount of beans to grind in order to get the job done. With nearly 2,500 reviews on Amazon, this 12-cup brushed metal machine also ensures a great tasting cup by using a charcoal filter to remove any flavor altering elements from the water and uses a gold tone filter. 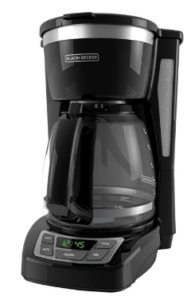 Features 1-4 cup brewing, auto pause and is fully programmable with automatic shut-off. Pros: A convenient and economical way to brew for yourself or a crowd without compromising flavor. Cons: Some users report built up condensation in the unit and others wanted the ability to adjust grind size. Check for price and sales on Amazon. While the Cuisinart may have a utilitarian appearance, the product it produces makes it easy to see why it’s one of Cusinart’s best sellers and ranked so highly on Amazon. 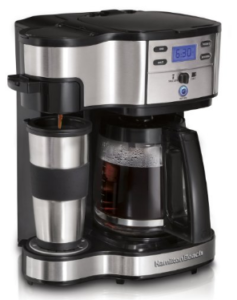 This 14 cup maker has a brew strength controller, allowing you to brew regular or bold flavor. An element of good coffee is quality water. Cuisinart capitalizes on this by including a charcoal filter and a gold tone water filter, which purifies the water and increases the coffee’s flavor. The second element of great coffee is temperature and the Cuisinart DCC-3200 allows you to customize this as well, producing hotter, but not burned, coffee. Pros and cons: For its price, it doesn’t include a single cup feature, but this coffee maker is programmable, has an automatic shut-off feature, is self-cleaning and is designed to maximize flavors for a few cups or a full pot. Another best for its bells and whistles is the Braun KF7150BK Brew Sense. For less than $100, this 12-cup coffee maker is sleek and sophisticated. Different settings allow you to adjust the temperature, grab a cup of coffee mid-brew and automatically program it to start up and turn off, so you don’t have to worry about rushing off to work and leaving your coffee maker on. Self cleaning, the Brew Sense is also designed to keep the condensation inside the pot and water off your countertop. Pros: Amazon users report that it’s stylish, well designed and easy to operate. Many noted that the 3-setting warming plate was a standout feature. Cons: Some users found it difficult to gauge how much water was actually in the coffee maker. Even coffee extraction and a fast brewing time are standout features on the BUNN BXB Velocity Brew. It’s wide spray head evenly coats ground coffee for a fuller extraction that’s impressive at this price point. Pros: Brews 4-10 cups in about 3 minutes. Users note that the flavor is consistent. Ditch your morning Dunkin’ run and fill your mug at home with this quick and easy one cup machine. For less than $20, this filterless personal coffee maker fills a stainless steel 15 oz travel mug, features an auto shutoff and is dishwasher safe. Pros: Low cost, easy cleanup and quick and easy to use. 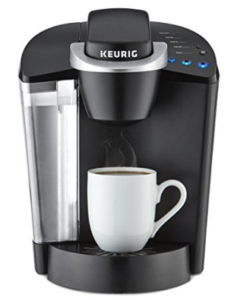 For K-cup coffee, the Mr. Coffee Single Serve Coffee Brewer is your best bet. K-cups are the most affordable and they’re widely available, which is good if you’re brewing multiple cups a day. 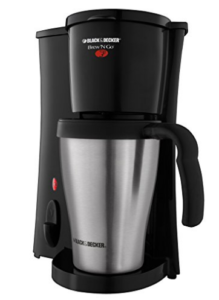 Another plus with this coffee brewer is that it holds 40 ounces of water, so you won’t keep having to refill the water canister every time, which is the case with many single cup machines. Choose between 6, 8 and 10 oz cup size — all brewed in under a minute. It’s also the perfect size for a small kitchen, office or dorm room. Pros: A crowd favorite on Amazon, many users prefer it to a Keurig, citing that the coffee was better tasting and brewed faster. Cons: One downside for some reviewers was they felt that the product wasn’t as durable as they had hoped. Check for price and current sales and Amazon. For fast and affordable coffee, check out our list of the best French presses. A consistent best seller on Amazon with over 6,000 reviews, the Keurig K55 coffee maker features a 48-ounce water reservoir that holds enough to make at least six cups before refilling and brews six, eight and 10-ounce cups, which also allows you to adjust the coffee’s strength. The Keurig K55 takes traditional K-cup pods but is also compatible with the My K-Cup Reusable Coffee Filter, so you can brew your own ground coffee. Cons: The Coffee maker is on the expensive side and has the added cost of buying K-cups. Find price and current sales on Amazon.